You are capable of much much more than you ever thought possible. 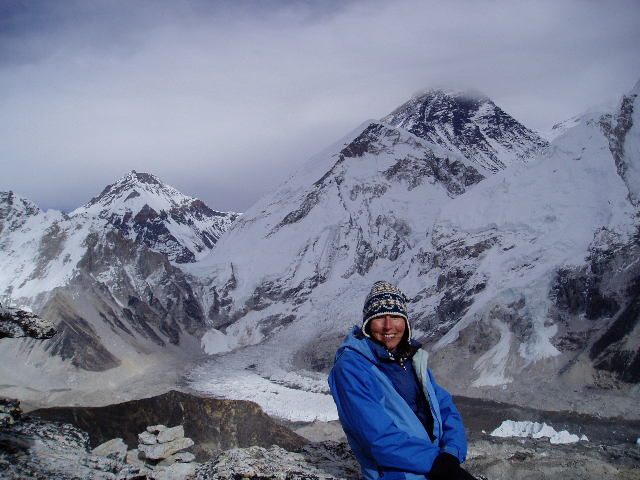 In 2004 Susan Harper Todd became the First British woman to be leader of an Everest Expedition and only the Fifth British woman in history to stand on the summit of Mount Everest. She has also sailed across the Atlantic Ocean and is the only British woman to have both sailed the Atlantic and summited Mount Everest. Susan grew up with hills and mountains and seas. She started out in life as a teacher and has a teaching degree in Outdoor Education and Environmental Science (B.Ed), but put that career to one side when she became an adventurer and stepped outside life’s boundaries. She challenged the limitations that are set for us by others and that we set for ourselves. And she challenged the beliefs that go with them. Susan lived and worked in Chamonix in the French Alps for twelve years. As well as being a qualified International Mountain Leader, she has also worked as a translator and has had four translated works published, as well as numerous articles of her own in climbing literature. During her years in Chamonix, Susan climbed, skied and trekked all over the European Alps and many other parts of the world, including the Himalaya. She is also a qualified ski instructor and has ski toured across the Alps from end to end, from Austria to the Mediterranean, in an epic journey over several winters – stopping just short of the sea. Susan is also a sailor and spent 2 months on a small yacht sailing across the Atlantic Ocean. On reflection, she sees this as part of her foundation for climbing Mount Everest. This experience brought with it the challenge of coping with isolation and the fear of something going wrong, weeks away from help. Susan believes this helped her gain the mental strength that is needed to cope with extreme challenges, such as climbing Mount Everest. Susan has spent a lot of time in testing situations. She has learnt to step over the fear threshold, to step through that barrier into the unknown and confront her fear. Because at over 8000 metres, on a narrow ridge, near the summit of Everest, there are only two ways to go, two choices. To carry on towards the summit, or to turn back. Choices that we so often face in life in pursuing our own goals, our own Everest. Turning back is easy, but on Everest, climbing higher into the ‘death zone’ is dangerous and involves great risk. However the greater the risk, the more challenges we face and overcome, the greater are the rewards. When Susan stood on the summit of the highest mountain on the planet and looked down on the earth from a perspective which very few people have been privileged to see, she realized for the first time, that anything is possible for anyone and everyone, everywhere. And now Susan has come full circle. She has in a sense come back to ‘teaching’ again, but this time in a broader sense of the word, armed with the knowledge, experience and a better understanding, of how she can make a difference in people’s lives. Using the skills she has acquired while on her journey through life, (having also trained as a Reiki healer and Life Coach), and viewing life from the platform and perspective of challenges overcome, fears faced up to and the seemingly unattainable realized, Susan wants to pass on what she has learned in a way that others can understand it and benefit from it. She wants to help people to see that not only do they have the ability to achieve their potential - but that they actually do have potential at all. That we all do. Everyone has their own Everest and Susan is here to help you to climb it.